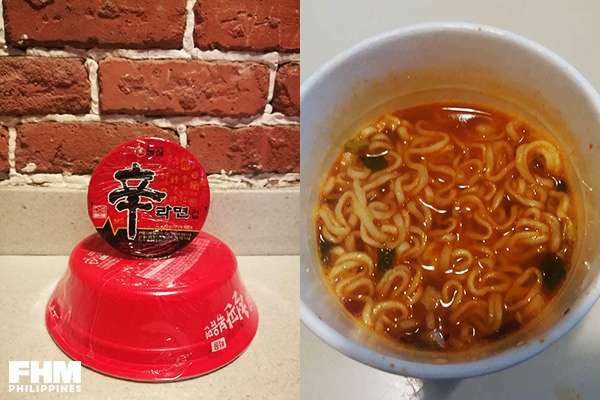 Spiciest Instant Noodles Available In The PH—Ranked! 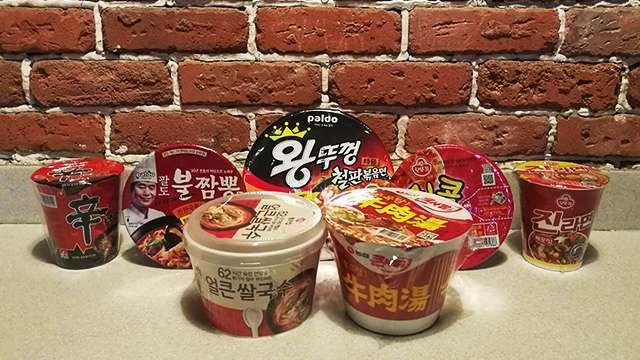 Koreans don't mess around when it comes to spicy food. We don't know if it's their country's colder climate, or if they're all genetically engineered to have tougher tastebuds than us Pinoys. Either way, their tolerance for the hot stuff is off the charts, so it's not really surprising that they came up with the 'Fire Noodle,' a notoriously spicy instant pancit canton variety that can only be finished by the most iron-clad stomachs. 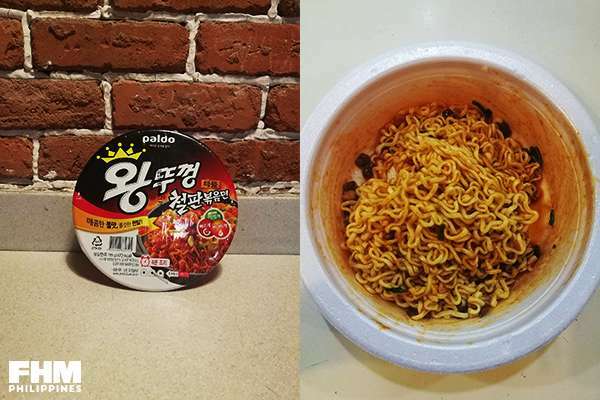 The most popular is SamYang Buldak's HOT (all caps para intense!) 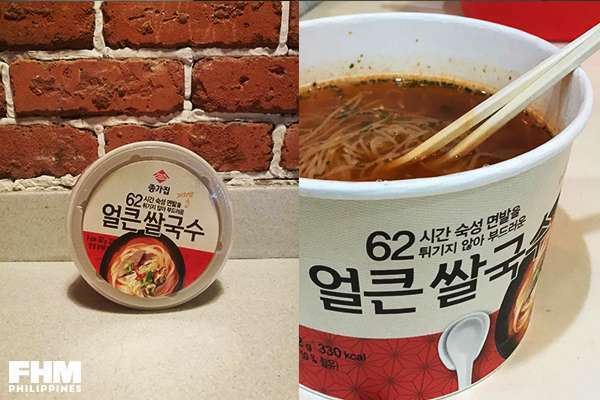 Chicken Flavor Ramen, which you can find in Korean stores across the country. The catch? It's usually wiped out due to its popularity, and deliveries can take a while. We had really high hopes for this: it was the most expensive of the bunch, and the packaging was impressive (it had an actual plastic lid!). But oh man, this was a disappointment. Our taste-tester was expecting a heat-packed noodle dish, but she got a sad bowl of “walang lasa” glass noodles instead. She didn't even finish it—she was that dismayed. Or maybe she just has a really high threashold for spicy food. If you're looking for a spicy noodle dish, this is not what you should pick up. The best thing about this noodle was the round slice of dried something (beef, probably) in the pack. It's not exactly the tender-looking slices of beef on the bowl's lid, but it's a step up from the sadder-looking dried meat bits in the other noodles. Taste-wise, it's milder than jjampong, and the spiciness didn't last long. A great pick for an intro-level spicy noodle. This one's a milder version of the famous “fire noodle,” with a savory-spicy sauce that has just a hint of sweetness. If you've had tteokbokki, this should taste familiar. 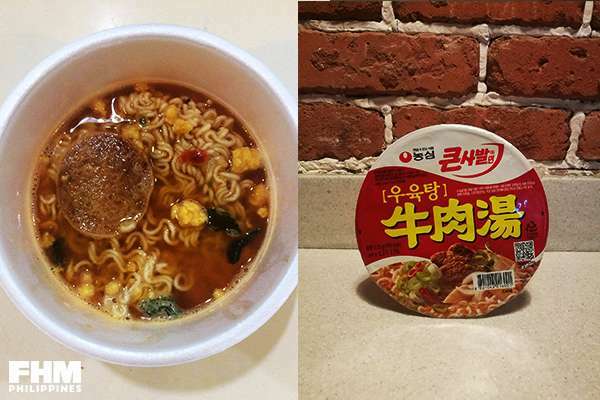 We loved that it had a naruto (fish cake) piece in the pack—it made the whole dining experience feel less “instant.” The noodles are thick and chewy and pretty filling. 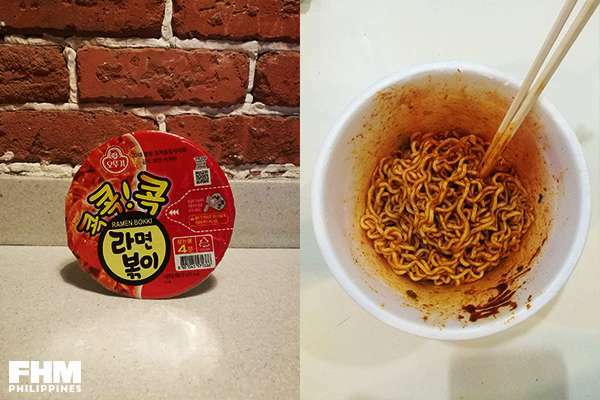 Consider it a warm-up to the actual SamYang Buldak Fire Noodle. 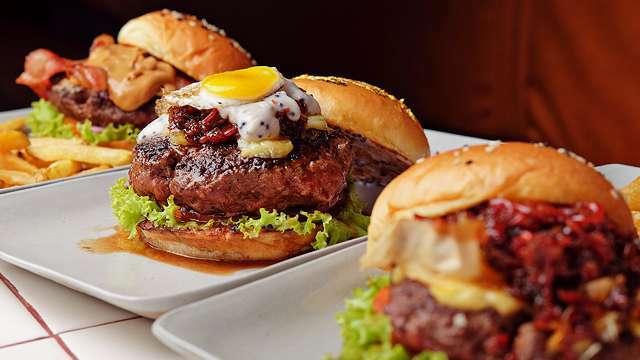 If you like jjampong, you'll love Paldo's upgraded version. The seafood taste is pretty pronounced, with a smoky aftertaste that's surprisingly good. The spiciness is definitely there, but it's tolerable, making it good to the last drop of the broth. The broad, flat noodles are nicely chewy. Throw some real seafood—some squid, perhaps—in the mix, and it'll be a great meal. They're not kidding with the “Hot” label. This one delivers a nice kick of heat, but the spiciness doesn't overpower the overall umami taste. The noodles remained on the firmer side, and didn't easily get soggy even when they'd been swimming in hot water for a while. The dehydrated vegetable bits were also surprisingly fun to munch on! 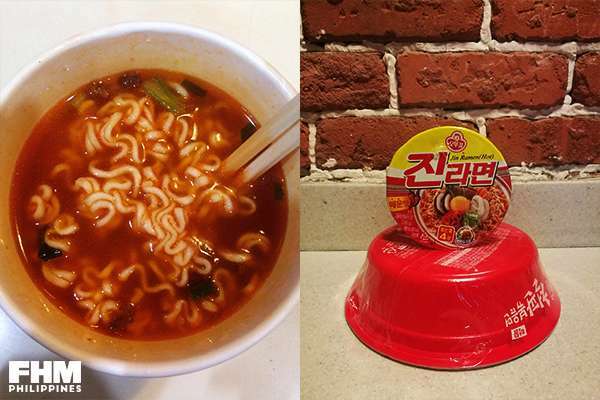 Shin Ramyun is one of the more famous Korean noodle types out there. It's not that difficult to find either—you can pick up a bowl in SM or Robinsons groceries, unlike the other brands on this list. It's easy to see why it's so popular: it's packed with heat, but it's a tolerable burn. The noodles are firm, and they soak up the flavor of the broth nicely. Our taste tester liked the pepper and mushroom bits, but would have appreciated more vegetables and more meat pieces. Overall, it's something spicy food lovers would want to have in their pantry at all times to satisfy their cravings. 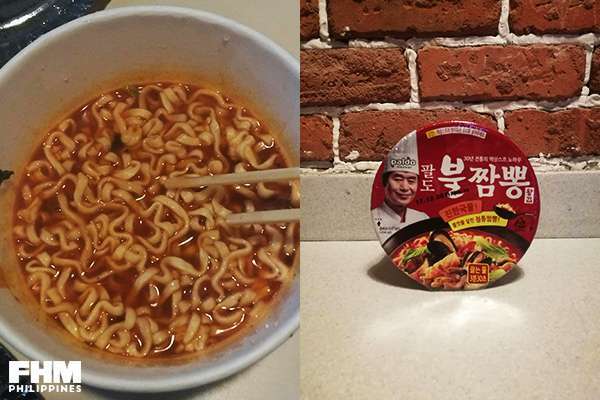 This one nearly dethroned the infamous SamYang Buldak ramen in our taste-tester's book. It was very, very spicy, with a smoky flavor that transforms into an intense heat that lingers in your mouth. There's a welcome hint of sweetness as well, but it's overshadowed by the spiciness. The meat and vegetable bits got along with the thick, chewy noodles nicely. Tastes smoky, has small meat bits. Very filling. Mashittda (delicious)!